I will instruct you and teach you in the way which you shall go. God doesn't leave us alone to try to figure out life all by ourselves. The Bible says that He is closer to us than we could possibly imagine. In Psalm 139, King David tells us that God knows everything about us and is familiar with all our ways (Psalm 139:1-3). 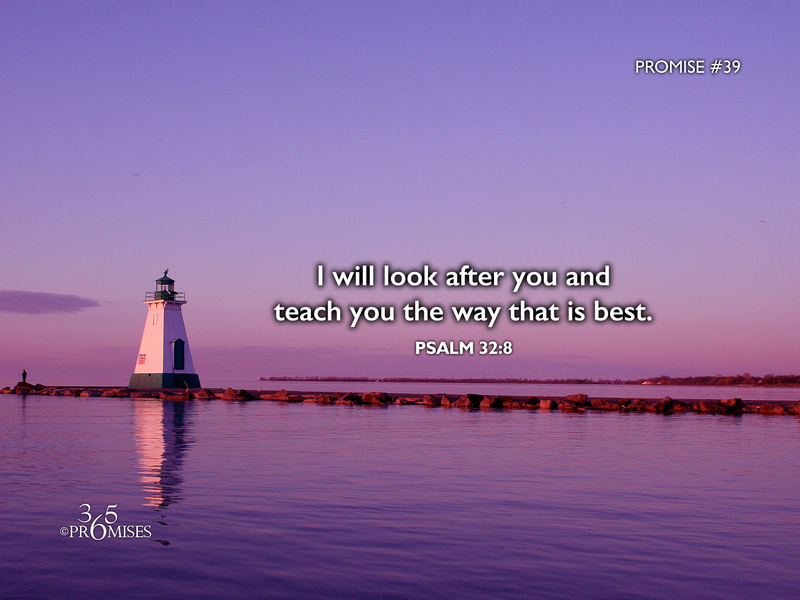 In today's promise, we read that God has committed Himself to teach us in the way we should go and guide us into what is best. The New Living Translation says Psalm 32:8 this way... The Lord says, “I will guide you along the best pathway for your life. I will advise you and watch over you. (NLT) May the promise of our Father's tender guidance bring a sense of rest and security to our hearts today. May we know that we are not alone in this life. Each step that we take is carefully guided by a loving Father who has only our best interests at heart. God is everything that we need when we need him. He is our father, our brother, our savior, our friend, our healer, our redeemer and our teacher. Time and space would fail to speak of the many ways that the Triune God (Father, Son & Holy Spirit) watches over us every moment of our lives.